Hanza Bath Bombs!! GO NOW!! 14 PREMIUM QUALITY BATH BOMBS - MADE IN USA ONLY: Handmade with Natural and Organic ingredients. 3.5 oz in size - Large size means Large Fun in the Bath Tub! 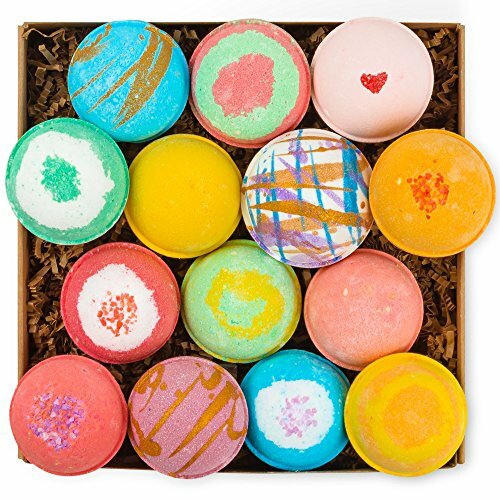 SUPERIOR VALUE: 14 unique bath bombs with two times the aroma and fun and still affordable. You can't go wrong with Bath Bombs by HanZá! Better than Bubble Bath, Bath Tub Teas, Pearls and Flakes! PERFECT GIFT IDEAS: Elegant gift set packaging makes these bath bombs look like jewels. Great gifts for women, moms, teen girls, kids and men - there's something for everyone. Bound to impress anyone. The perfect of relaxation gift ideas for anyone. On the wish list for Mothers Day gift, Birthday gift. Best of gifts for her, women, spa/bath gifts, perfect gifts for mom and wife. Men love our bath bombs too! HEALTHY AND SAFE CHOICE: Contains natural ingredients such as shea butter, essential oils and clays. Superior moisturizing effect helps with a number of skin conditions such as itchy and dry skin. Unlike other brands, our bath bombs will not stain your skin nor your bath tub!